A morning breakfast at Chandni Chowk is not complete if there is no Nihari on the table. Karim's, one of the most established restaurants in the Gali Kababiyan is critically acclaimed for serving a great Nihari though there are others like Kallu, Bilal and Haji Shabarati Nihari Wale which do an equally if not a better job. Served with Khameeri Roti, which is a soft and fluffy roti made with the fresh smell of yeast, the Nihari is basically a calorie laden meat stew garnished with ginger and green chillies. Karim's welcomes customers in the morning with the sight of handis on coal fueled stoves, in which the Nihari dishes are slowly cooked. Though the authentic versions are made of beef, the restaurants in the Urdu Bazaar road primarily make it of buffalo while Karim's uses mutton, majorly for sensitivity issues. 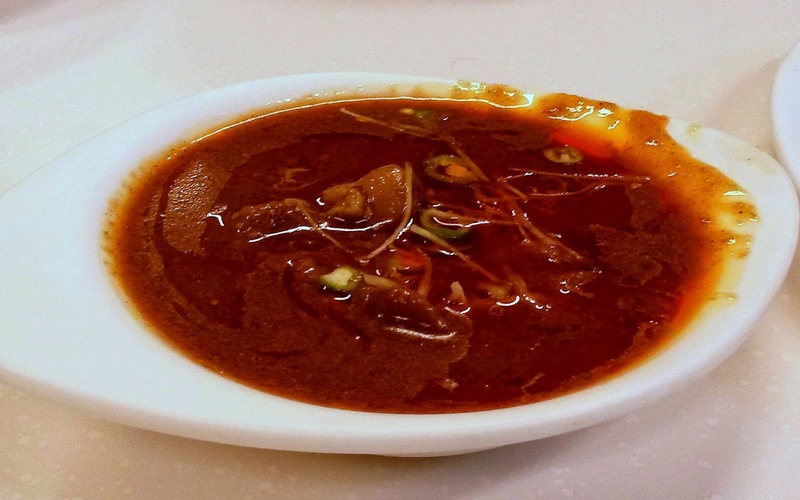 Nihari, in general, comes loaded with oil and is definitely not for the health conscious. Ours at Karim's was no different and had a garnishing of slivered ginger and chopped chillies which cut the richness of the dish. The meat had been cooked slowly for hours before being served and the thick consistency of the dish was simply amazing. Karim's also serves Paya for breakfast which is essentially the slow cooking of the goat trotters till the gelatine seeps off the marrow. Nice post. Karim's has a distinct taste. I particularly like the saundhi aloo in the veg fare. I have never tried the saundhi aloo. Is it available only for the breakfast or do you get it even during the regular timings?